On sale now at your Naperville and Aurora Chevrolet dealer, the 2017 Chevrolet Cruze LS is a compact sedan that checks off all the boxes of a great sedan. US News says, “The Cruze provides an elegant exterior, comfortable interior, a user-friendly infotainment system, a smooth ride, and strong fuel economy.” Chevrolet of Naperville is offering the 2017 Chevrolet Cruze LS for sale. The Cruze LS is powered by a 1.4L turbocharged 4-cylinder engine. Standard equipment includes 15-inch steel wheels, remote locking/unlocking, air conditioning, a height-adjustable driver seat, 60/40-split folding rear seat-backs, Bluetooth connectivity, and a rearview camera. Contact Chevrolet of Naperville to schedule your test drive! You’ll find a full range of vehicles at Chevrolet of Naperville, including the Chevy Cruze LS compact sedan. You can rely on our knowledgeable staff to provide your trim, finance, and lease options. Chevrolet of Naperville has over forty-five years of helping Aurora drivers choose their perfect vehicle and we are ready to help you with your next purchase. Our full service finance department has a host of Chevy rebates and incentives available to you. Get pre-qualified for auto financing from the privacy of your own home or office. Chevrolet of Naperville also employs factory-trained and certified technicians to handle all of your Cruze LS service needs. 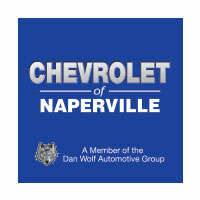 Chevrolet of Naperville gives you the assurance you’re looking for in car shopping.